After reflecting back on its hundreds of sketches, more than 50 episodes and five strong seasons, many words come to mind when attempting to describe Comedy Central's Key & Peele. The brainchild of sketch comedy masterminds Keegan-Michael Key and Jordan Peele, K&P was refreshingly bold, delightfully absurd, sometimes utterly ridiculous, but always sharp-witted, cinematically-inspired, skillfully crafted and socially-conscious. What's even more impressive when framing the show's legacy is that there is still much more defining to do, as the series will assuredly continue to live on as an influential sketch comedy game-changer, just waiting to be discovered online by future generations. But as the closing minutes of last night's two-part Key & Peele finale clearly illustrated, its creators didn't think about the indelible impact the series would eventually make on the comedy world. Opting to end the series with a gag reel - during which, the show's title performers finally got to laugh at themselves - and a callback to the show's very first over-the-top sketch, Key & Peele reminded us that it never set out to be groundbreaking. In one of the final on-the-road interludes, the two comedians even joked about the notion of the show being some great thing. Very simply, they just wanted Key & Peele to be funny. And by filtering American culture, its current state of race relations and their own personal take on sociopolitical issues through an honest lens, the series was almost always funny, while still providing food for thought and room for healthy and important discussions - whether sketches were tackling gay marriage, teachers' wages or the Ferguson shooting. Key & Peele has certainly always been a comedy show first and cultural talking point second, but the combination has made it unquestionably relevant - no matter how much the satirist duo downplays that fact - and both of those qualities were on display again in last night's well-balanced finale. While the second half of the finale certainly closed things on a light note, the first episode, titled 'Meegan and Andre Break Up', ended up being the less hefty of the two. It was also the least affecting and effective of the two parts, but still contained plenty of laughs, with a sketch playing on perceptions of African-American male machismo; a spoof of a Charlie Rose type program, on which a Kanye West-like figure (Peele) loses his cool; and a sketch featuring an apparent Nazi (Key) attempting to convince a friend (Peele) that all the telltale signs of his admiration for the Third Reich are just a big misunderstanding. 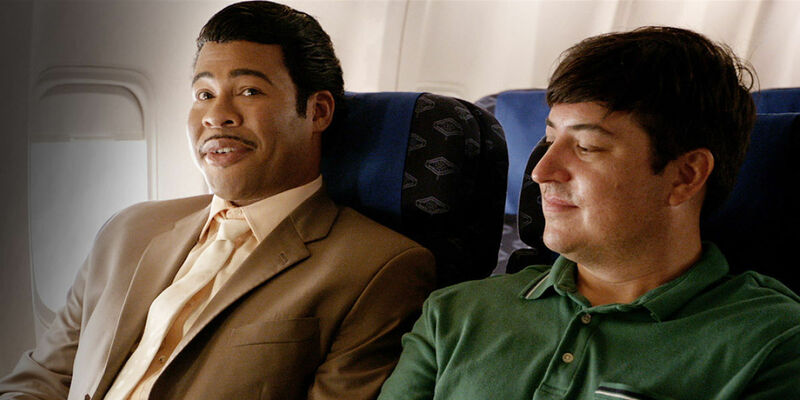 However, for the Key & Peele loyalists, the highlights of this first two-part act will likely be the sketches involving familiar characters, including an over-delighted airline passenger (Peele) - who enjoyed himself far too much at a hotel's continental breakfast in season 3 - and the popular dysfunctional couple Meegan (Peele) and Andre (Key). As usual, Meegan and Andre have the most memorable exchange of this first episode, during which they appear to finally break up before the emotionally manipulative Meegan hilariously convinces clueless Andre to stay in the damaging relationship. It was certainly a fitting last glimpse at these characters, who would've always been in the same rut with one another, no matter how long Key & Peele stayed on the air. In breaking away from recycling past material, part two of the finale, aptly titled 'The End,' introduced some more inspired bits, including an uproariously funny fake infomercial for a collection of Ray Parker Jr.'s (Peele) unused movie theme music; an efficient gag featuring a man (Key) who falls in love with a beautiful, but unconscious woman; and a slightly less amusing one-note sketch centered on a stubbornly immature businessman (Peele). However, the standout of the bunch was the finale's darkest and most racially-charged piece, which ended up being the show's final sketch. That final sketch was a prime example of that aforementioned combination of cultural relevance and wit, as a white cop arrests an innocent black man (Key) before things take a bizarre but hilarious turn. The officer then releases the man to a magical hobo (Peele), who guides him through a mysterious portal and into Negrotown, a black person's utopia. By illustrating the trials and woes of a black person in today's society in the style of a 1950s musical, the comedy of the sketch worked on its own as a humorous juxtaposition of serious social issues set to upbeat music. But, as Key & Peele sketches often do, it unveiled another, darker layer as Key's character awakes from what was a only a dream, revealing the harsh and unfortunate societal reality of existing racism while poking fun at it at the same time. Over the course of its five-season run, not every Key & Peele sketch hit the mark like most of last night's did, but almost every single one was wholly original. Their concepts could be derived from a current event or hot-button social issue, yet were always imprinted with that signature K&P tinge, which twisted or turned the concept in an unexpected way. That unique comedic voice is a rare thing these days, and so it's what will likely be missed most with the series' end. Of course, the good news is, as we mentioned earlier: There's no question that the show will live on. Key and Peele may have gotten the last laugh as the series faded to black, but we'll get plenty more from the infinitely watchable clips that will exist online (where the show first found a mass audience) for years to come. What did you think of the Key & Peele finale and the series as a whole? Let us know in the comments.